Mexican is one of my favorite foods – meat, cheese, beans, avocado, sour cream – what could be bad? Not exactly kosher (although vegetarian bean burritos would be) and so a challenge to find in Israel. There is a Mexican restaurant in the Old City, but apparently their idea of a burrito is shawarma wrapped in laffa with some avocado. Hardly adequate. 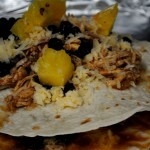 My friend Beth and I decided for our first joint dinner venture we would have Mexican night. 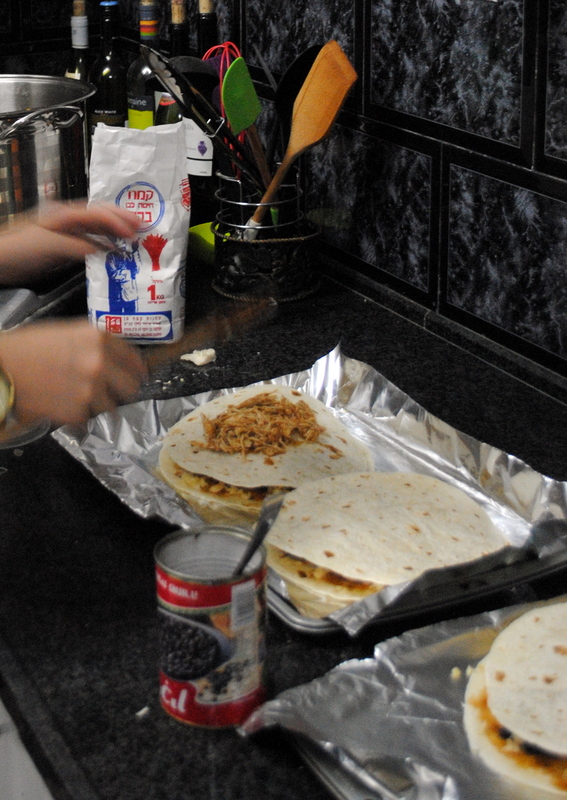 We easily found tortillas, black beans, cheddar cheese, sour cream, and avocado in the supermarket. And off we went! We started by making guacamole and pita chips. Then we used an incredible recipe that Beth developed for Open Stacked Enchiladas – you can check out the recipe here on her blog. 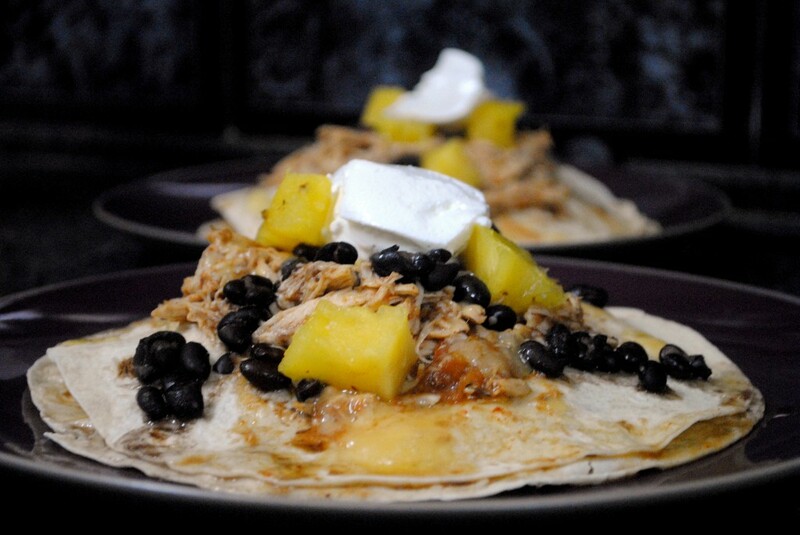 Basically you poach chicken breast in pineapple juice, shred it, then layer it between two tortillas with black beans, cheese, and fresh pineapple. Throw it in the oven just until the cheese melts, top with sour cream, and you’re in business. It was so good. 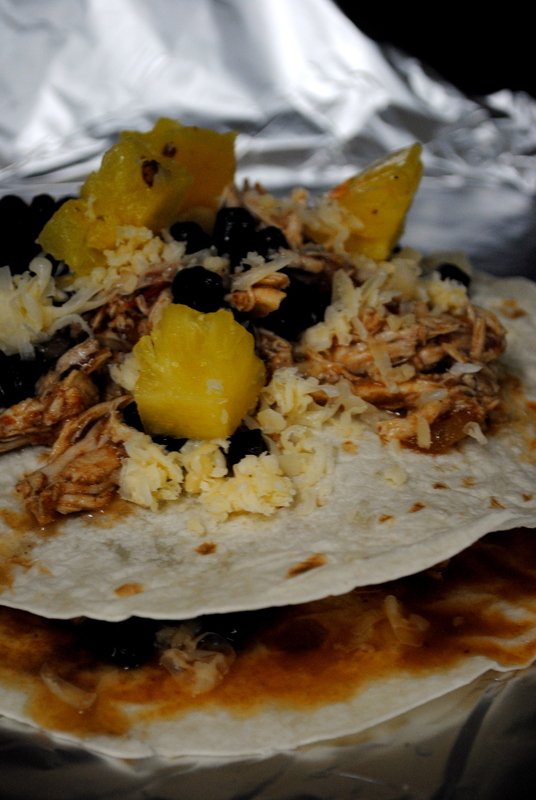 We had a ton of leftover chicken, so I hear burritos calling in our near future. I love the idea of poaching the chicken in pineapple juice. I would never have thought to do that. It sounds like a nice flavor contrast to the black beans. Delicious!